Summer travel is in full swing and I’m always looking for items that make me feel more comfortable and secure, whether I am traveling to Europe or to our local San Diego beach. 1 Voice Sleep Headphones Eye Mask is for you. The mask itself is made of memory foam, is plushy and comfortable, and does a great job of blocking out all light due to its generous size. But the really cool feature is the fact that the headphones are built right into the mask, so the only thing between you and soothing music on your phone or MP3 is a light cord (provided). Oh yes, did I mention the mask is machine washable, making it easy to keep clean. Having just one item that takes the place of two also saves room in my travel carry-on—always a plus. Speaking of beaches, I now have a favorite water tumbler to cart along in my beach bag—Zerowater. In my quest to rid myself (and the environment) of plastic water bottles, I now make my own filtered water using this innovative system. Just fill it up with tap water and let its 5-stage Ion filter do its job on all impurities such as aluminum, lead, mercury, pharmaceuticals and chemicals. The tumbler does such a great job in removing these pollutants that it has earned top endorsements by Good Housekeeping, the Water Quality Association, and the National Science Foundation. The sturdy, leak resistant and BPA-free bottle holds a substantial 26 oz of water, perfect for a hot day at the beach. It pays for itself, especially if you are a frequent flyer. Just cart it empty through airline security and head to the nearest public water fountain—knowing you are getting the purest of filtered water without having to pay those inflated prices for bottled water. Who ever thought self-defense could be stylish? I always carry pepper spray, especially when I am walking in a big city on my travels, but I always end up tucking the ugly spray container in my purse (which sort of defeats the purpose if I needed it quickly). 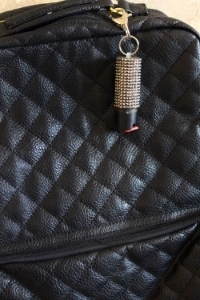 The Blingsting pepper spray line was created by a mother-daughter team whose love for anything cute and sparkly got them thinking that, if women had fashionable choices for personal safety, they would be more likely to keep them handy. The spray comes in 8 colors to match any outfit, and it’s even refillable so if you have to use your sting, you don’t have to lose your bling! Be warned, however, that the spray (which is so cute you might forget to take it off your bag) is not allowed on commercial aircraft. It is certified for use in all 50 states. Being safe never looked so good.